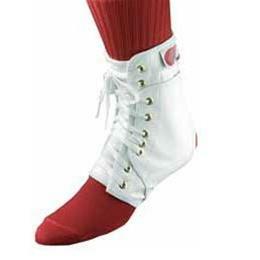 Featuring the patented Ankle Lok™ system which keeps the brace tighter longer. This ankle brace is 30% lighter and 50% thinner than conventional lace-up ankle braces. A full elastic back and seamless arch virtually eliminate the chance for blistering and the "Figure-8" straps mimic an athletic trainer's taping procedure.